Is it possible to say just what the Cirque Plume, which has just set up in Venlo, is really all about? Of course they do perform circus acts, with the trapezist doing her dizzy turn at the top of the big top. But there is also comedy, with the act when the piano grows arms and wandering hands, making life difficult for the poor singer. Splendid dance with a superbly supple girl who moves about the stage, held in the soft light of a spot light. And even puppetry with the tight-rope dancer letting herself be led along the wire by a ghost. Surprising theatricals too, such as the boxing match in the upper reaches of the immense big top. Fantastic originality with the girl who climbs up a long drape towards the top, folding the material in such a way as to nestle in its folds as in a mother’s womb. Or throw herself out to be held by one leg caught in the cloth. You want hair-raising stunts? You won’t be disappointed. A harum-scarum cyclist takes advantage of the trampoline to literally jump over a group of women. The artiste/actors of the Cirque Plume are clearly and astonishingly polyvalent. Thus the conjuror, having performed his magic with that certain distant look, busts into a lively rock number, letting rip on the drums as the guitarist, like a budding Nils Lofgren, plays his instrument on the trampoline. And all this is performed, apparently, with the greatest nonchalance and, at the same time, a certain not quite French perfection. No smell of saw-dust here, but the atmosphere of a theatre. And just one animal, in the form of a poor mongrel which lets itself be tamed by some musical saws. Those who like moments of heart-touching tenderness can fill their eyes with the Magic Lantern type act featuring a man and a woman. All this is bathed in exquisite balanced lighting and carried along on excellent music.  The performance of "L’harmonie est-elle municipale" has already been described as a dream, and like a dream it is not easy to grasp. The Cirque Plume has something new to show to them all : to the theater, the circus, the arts, and comedy. "Write us up a really critical review, so we can get something out of it", asked one of the performers after the show. But, to do that would be, for the moment, just too much - to wake up from the dream called Cirque Plume. And so it is quite right that the spectators should go off home with the little cushions distributed at the beginning of the show.